Thats the first time I have seen that bucket I think. Quote: TS-08 Rebecca will release in early June this year. 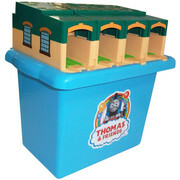 This bucket set has been advertised for a whlie now...it's already been released, and the way it is presented, makes it seem like it comes with engines? Is including her as part of the bucket the ploy to selling the bucket? Idk, but it's weird that she pictured inside of the shed as part of the bundle. What I find odd is that the other 3 pictured trains are Tank Engines (no tender) to fit in the sheds but Rebecca has a Tender that would not fit. So even if she was included would she have a Tender? 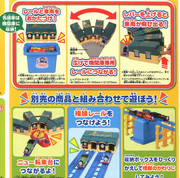 (04-04-2019, 05:32 PM)Muddy Poppins Wrote: I am confused...why am I seeing a Plarail Rebecca? Rebecca is not a part of new bucket set. The new bucket set has nothing different with the previous one which released 5 years ago except for color and stickers.